No matter how deep you delve into Magical history, you will not encounter another card effect similar to my "PREMONITION". When first introduced to fellow magicians, "PREMONITION" was greeted enthusiastically. Many knowledgeable members in the profession proclaimed its merits unstintedly. Others soon learnt of its singular entertainment potentiality and included it as a feature number in their acts. My files are full of laudable comments gathered from various sources. Two of these in particular I wish to record here. The first from that veritable human encylopedia of Magic, Sid Lorraine. In his published criticism he stated "To our mind it surpasses anything we have come across for sheer MIRACLE - LIKE effect. Here is an effect that should WOW any group. It's a natural for those doing a mental act, but even those without mental equipment can create a great effect with the Joseph miracle". The second came from Eddie Cleaver who for many years in past was the editor of the LINKING RING PARADE. He had this to say about yours truly and his PREMONITION. "His originations have won him world acclaim and with his latest rave effect "PREMONITION" he has acquired a niche in magic's Hall of Fame that cannot be disputed". However, much water had since passed under the bridge. Over the past many years I have been working to strengthen further my original conception. I have succeeded in more ways then one. As a matter of fact it had undergone a complete change. It is in this modern form and new dressing that I have pleasure in presenting it to you. 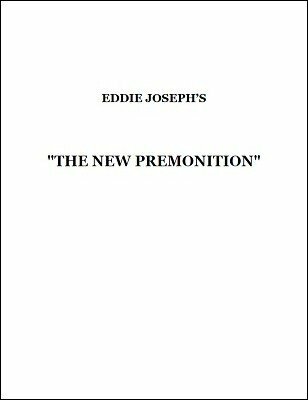 I re-titled the trick "THE NEW PREMONITION." Those in possession of the older version will soon be able to appreciate the many finer facets injected in this latest release. In the original presentation only one member of the audience was employed whereas we now use TWO. And - what is regarded as another strong feature of our present innovation THE EFFECT IS REPEATED IMMEDIATELY. I have developed a different original principle which will be fully explained in its proper place in the text. The refinements has raised an already established and reputable piece of magic to even greater heights in the sphere of unfathomable mystery. The effect is pretty much the same as in the original Premonition only done twice in a row with two spectators and two decks.